Misal pav is a very famous dish of Maharashtra, India. As the name says; it contains pav which is a type of bread kinda dinner rolls with spicy misal (moth bean stew). 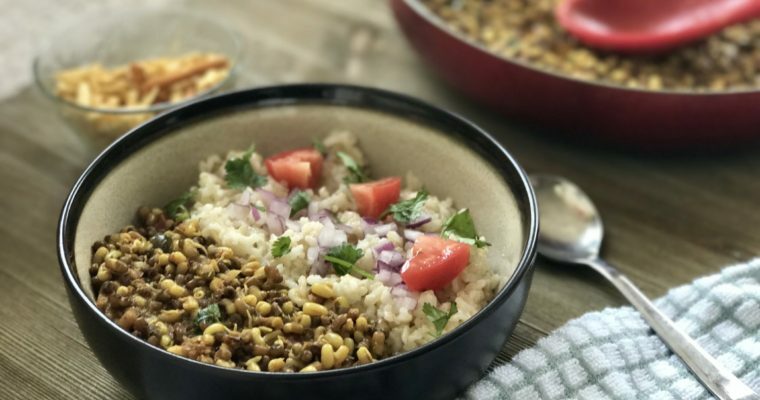 It is can be made by using any sprouted beans like moong beans, moth beans (mataki), black chana or mix sprouted beans. Usually in Maharashtra, India they make it with the sprouted moth beans. As like other legumes and beans this beans are also high in protein. 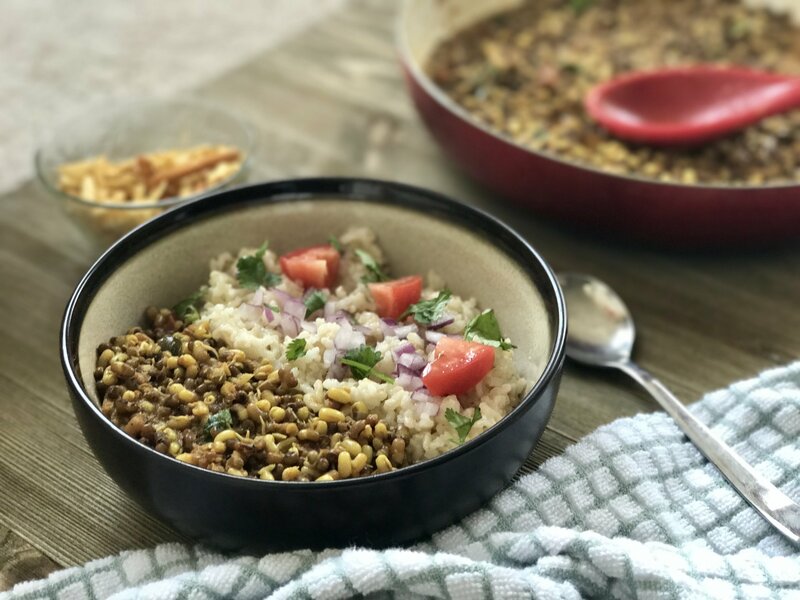 check for health benefits here..
Misal rice bowl is my attempt to create a healthier twist to this classic recipe so we all can enjoy Misal flavor more often without loading on extra calories. High fiber contains of the dish might help you to lose weight. Little change in our lifestyle will make huge impact on our health. 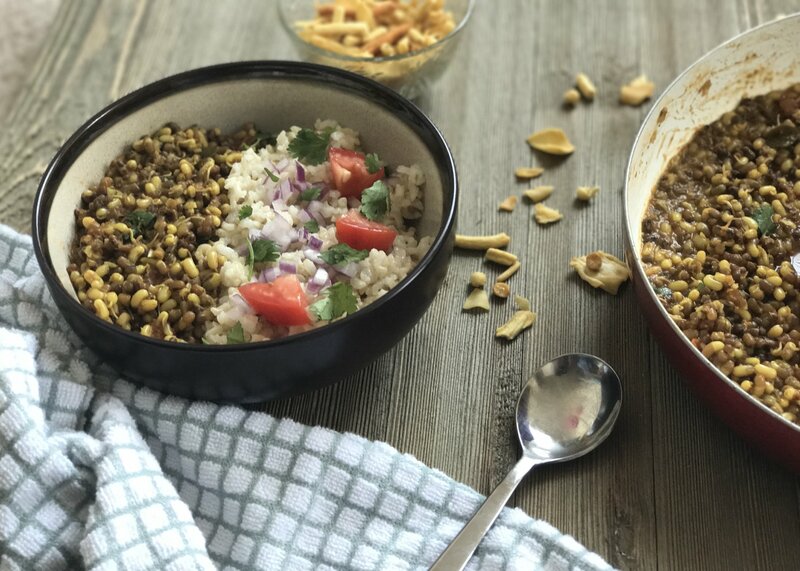 Misal rice bowl, tastes like nutty ness of moth beans with maharashtrian flavors, bit chewy brown rice with crunch of onion, tomatoes and farsan (combination of thick sev with papdi) which is a combination of thick and thin chickpea flour snacks which is a tummy filler. Check more traditional healthy recipes like Baked vada, Baked dahi bhalla, Baked moong dal vada, Broccoli upma, Tofu bhurji brown rice dosa (GF savory crepes) or No sugar muffins here. Spiced sprouted moth bean along with brown rice. Pressure cook sprouted moth beans (math) for just one whistle. Heat pan on a medium flame. Take oil in a pan and add chopped onion to it and saute it until golden brown. Add dry dessicated coconut and saute it for a minute or till the time it will turn light brown. Switch of the flame and let this mixture cool down after that grind this mixture to a very fine and smooth paste. Heat the same pan with oil in it. Add finely chopped onion. Saute it until it turn translucent then add ginger garlic paste and finely chopped tomato. Saute it for about a minute or two then add salt and all the spices(masala) except garam masala. Cook it thoroughly and then add onion and coconut paste. Let it cook for another 1-2 minute. Now it's time to add cooked moth beans. Mix it well in masala or gravy. Finally add water to desired consistency. Simmer it for for minutes and add garam masala and cilantro to it. Mix it well and serve it hot with brown rice or roti or paratha with sprinkle of farsan (sev-papdi). 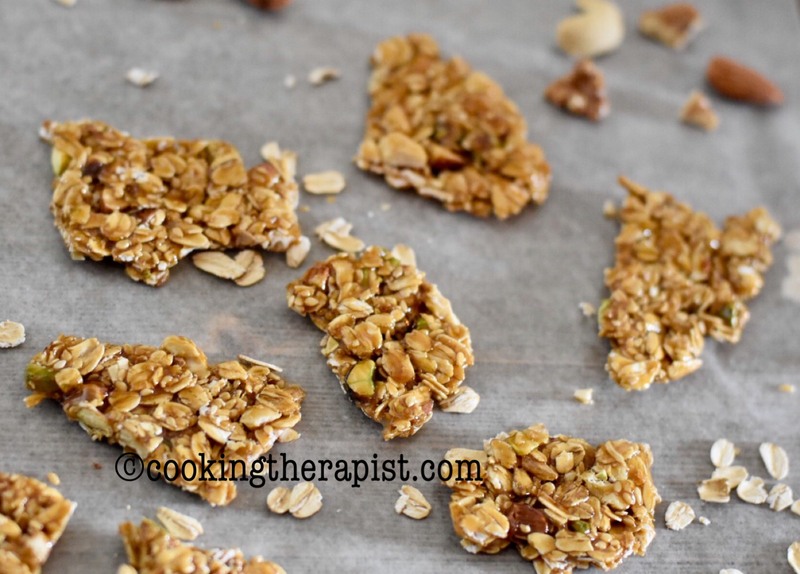 Change The Way You Cook and don’t forget to exercise! !